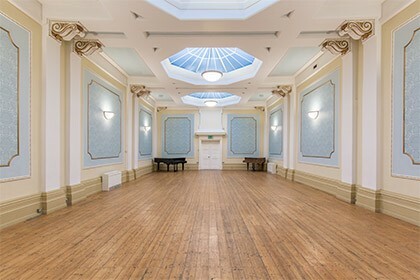 Following their return to local ownership in 2011, restoration of Faversham’s Assembly Rooms in Preston Street renewed their mid-Victorian splendour and made them again available for public hire after many years’ military use as the town’s Drill Hall. With a stuccoed, Italianate facade and suite of graceful rooms the Assembly Rooms were opened in 1849, one of many provided from the 17th century in county towns such as Buckingham and York and spas like Bath and Tunbridge Wells. Few now remain. Grade II listed, the building is a rare and elegant gem. The architect for this minor masterpiece was the talented and versatile Martin Bulmer from Maidstone, the builder was local man Thomas Ware. The main room is rectangular, 54 feet long and 28 feet 6 inches wide, with a musicians’ gallery above an internal porch that provides entry from Preston Street. Its refurbished interior features restored decorations in period detail. Windowless in design for privacy, the room has large octagonal lantern-lights in the roof that enhance a restrained, classically elegant space with excellent acoustics. 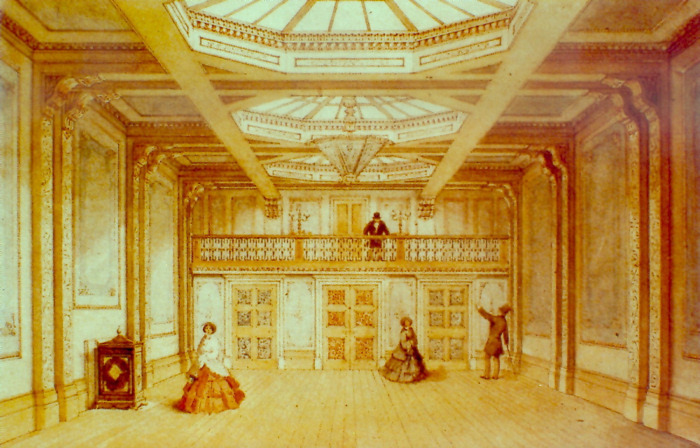 Georgian and Victorian assembly rooms were private ventures supported by subscribers and, in a society becoming more sophisticated, met a need for venues where the gentry could meet socially, in particular for balls, banquets and similar ‘assemblies'. The present Assembly Rooms are on the site of an earlier suite that also hosted local social events, such as an 1841 Conservative banquet held to celebrate the return (unopposed!) of Sir Edward Knatchbull as MP for East Kent. That suite burned down in September 1848, but was rapidly replaced by today’s rooms, with a courtyard and a house for a caretaker, now a private dwelling. 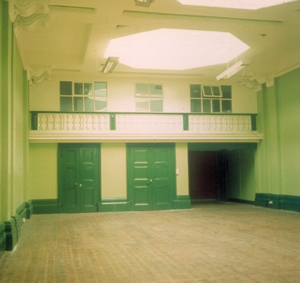 In turn the earlier suite had replaced an assembly room at 12 Market Street, in use from the end of the 18th century. Probably a modest affair, it was either converted from part of an existing building or added as a rear annexe. By the 1830s it had become too small to meet local demand and was superseded by the larger purpose-built premises in Preston Street. Initially the 1849 Assembly Rooms proved a great success. In 1850 they hosted a crowded meeting which roundly condemned the appointment of Roman Catholic bishops in England (perhaps explaining why Cardinal Newman complained that Faversham was the most Protestant town in Britain). Eight years later, when the railway finally reached town, the Lord Mayor of London and many of the company directors held a celebration dinner there. However, in 1862 competition arrived in the form of the new Faversham Institute in East Street (where John Anderson Court now stands). Of all Kent Institutes this had the biggest membership, with accommodation to match, including a splendid multi-purpose first-floor hall. Big functions began to forsake the Assembly Rooms and in about 1869, to make ends meet, the proprietors hired them long-term to the 'Volunteers' - the counterpart of today's Army Reserve (Territorial Army). From 1911 the War Office took full responsibility for the site and until the early years of the 21st century its use was confined chiefly to military purposes. For many years the hall was used by the local Army Cadet Force (ACF) and the caretaker’s house by the Air Training Corps. On the opposite side of the courtyard from the main building is another rare Grade II listed survival - a purpose-built gun-shed added to the complex in about 1870, now restored for ACF use. Close to a century of mostly military usage proved to be a period of ‘benign neglect’ during which little work took place other than maintenance and repair, but which happily preserved the building’s fabric in fundamentally good order. 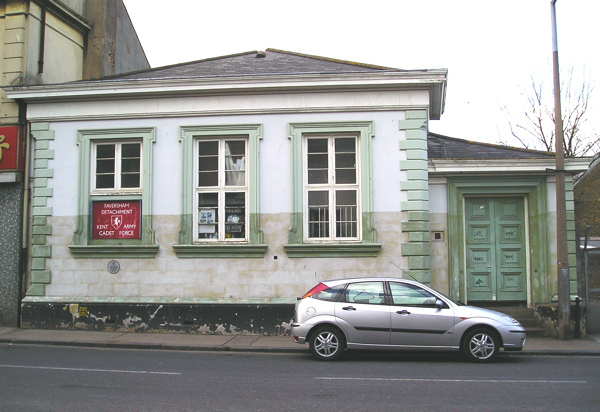 In 2010 a new charitable trust, the Faversham Buildings Preservation Trust, was formed to buy the Assembly Rooms from the Ministry of Defence. The purchase was made with the help of a loan from the Architectural Heritage Fund and completed at the end of April 2011. A six year programme of restoration work was launched in 2011. Funding of that comprehensive refurbishment relied to a great extent on public contributions and grants.